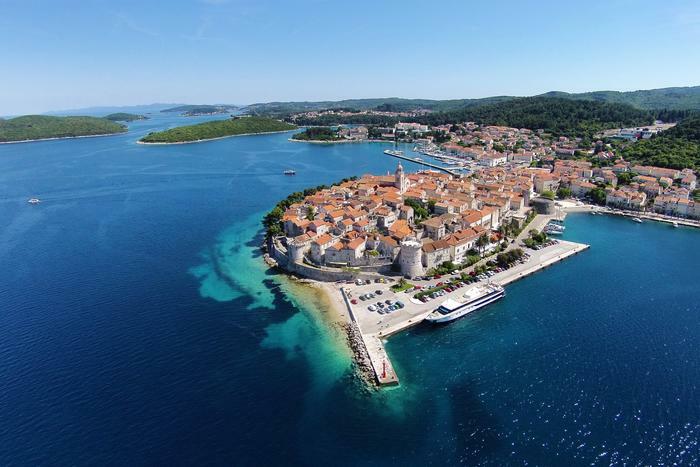 One of the most popular islands in Croatia is Korčula. Every visitor is bound to fall in love with its local food, beautiful downtown area and crystal clear sea. So, if you're planning on visiting this amazing island, here are top 7 things to see and do in Korčula. Beaches on Korčula alone are enough to make it a perfect summer destination. Encircled with a crystal clear sea, the island is dotted with numerous coves and beaches that you can easily reach by a car, scooter or boat. Be sure not to miss some of the most beautiful and unique beaches: Pupnatska luka on the southern side of the island, the sandy Pržina in Lumbarda and St. Nikola beach in the town of Koručula. So, don't wait, just book an apartment or a room in Korčula and come to enjoy these amazing beaches. This traditional sword dance dating back to the 17th century is performed all summer in Korčula, but the most important event is on July 29 – the day of St. Theodore, protector of Korčula. This mock battle dance developed on the basis of European cultural trends of the time and it shows the dispute between the black king Moro and the white king over ''Bula'', a beautiful girl who was kidnapped by the black king. The battle finishes with the return of Bula to the white king Osman. Korčula Town Musecum is located in the Gabrielis Palace, a representative example of architecture on Korčula in the 16th century. The museum is home to interesting shipbuilding and stone-masonry collections, as well as unique exhibits such as a piano from 1819 which was owned by Beethoven's friend Edith Streich. On the way to Lumbarda you can find this unique church and monument of park architecture. The church was built in the 14th century and in order to reach it you have to go up 102 steps surrounded by cypress trees that were planted in 1708. This climb is definitely worth the effort - the view from top of Glavica on the Korčula archipelago is absolutely spectacular. Only 20 minutes boat ride from the island of Korčula you'll find this uninhabited little island where you can enjoy the sun and the sea surrounded by absolute peace and tranquility. Badija covers the surface of one square kilometer and is covered by dense pine tree forest. The island is home to a namesake monastery dating back to the 15th century. This Gothic-Renaissance cathedral was built throughout the 15th century and today it's one of the top attractions on the island of Korčula. It was designed by Italian architects and mainly built by the local people. Local Korčula wine is an absolute must-try! For thousand years winemaking has been one of the main activities on the island - tradition handed down from generation to generation. Famous grapevine varieties are Pošip, Rukavac, Grk and Plavac mali, and wine made from them is so good you can't go wrong no matter which one you try.